For many years, the Doblò, manufactured by the Italian automotive company Fiat, was the best selling small-sized van in Italy. That was until 2007, when it lost its top spot to the smaller Fiat Fiorino. Launched in 2000 (substituting) the older model Fiorino, it has continued to be a great success, proved by the notably improved second generation, introduced in 2009. 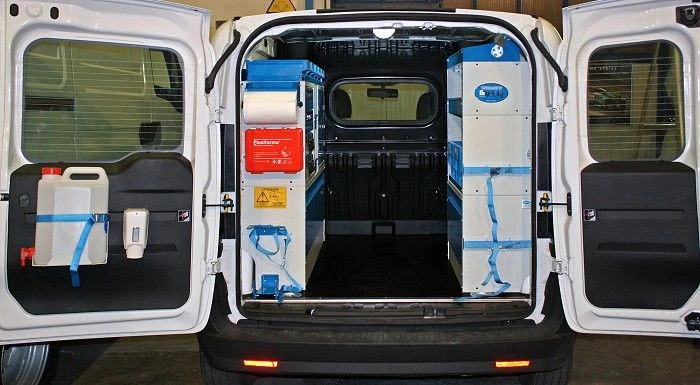 The large cargo space makes the Doblò ideal for both transporting materials and for transformation into a mobile workshop, thanks to Syncro System's van shelving and drawer units. On this page, you can see a typical upfit of the Doblò, with shelving units on both the right and left sides of the cargo area. 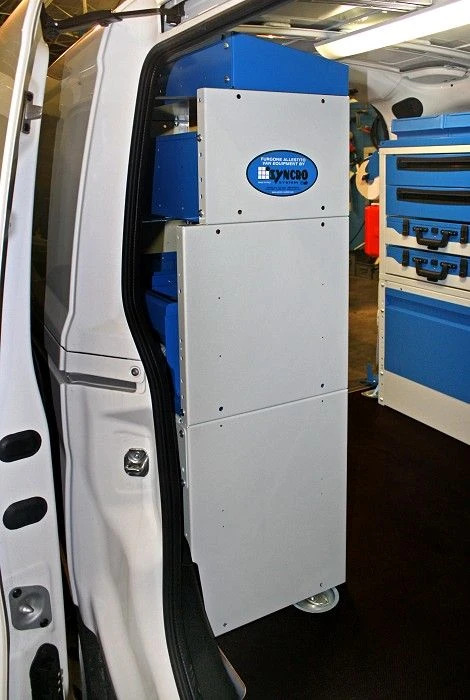 On the cargo floor, we mounted a specially constructed plywood floor panel with the classic Syncro extra-durable, anti-slip finish. 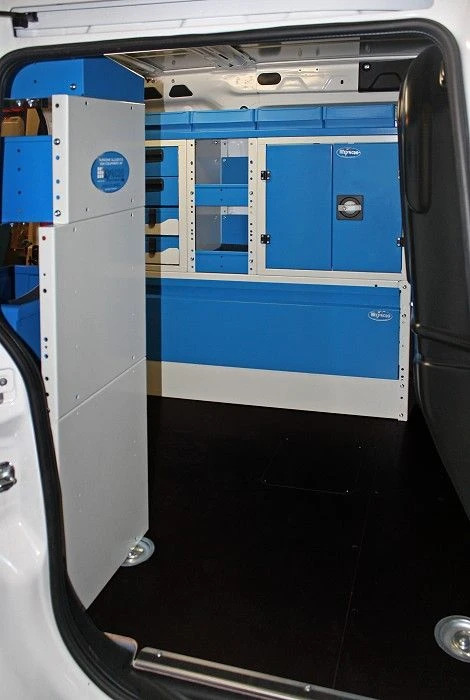 Protective steel borders (as with all Syncro floor panels) were positioned along the lengths where the van doors are. 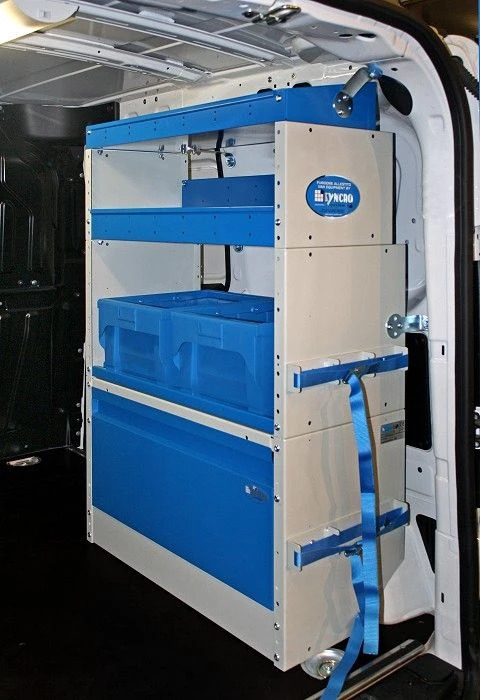 The interior racking system on the left side consists of a closed wheel arch base with a hinged front door, providing ample storage for securing tools and materials. 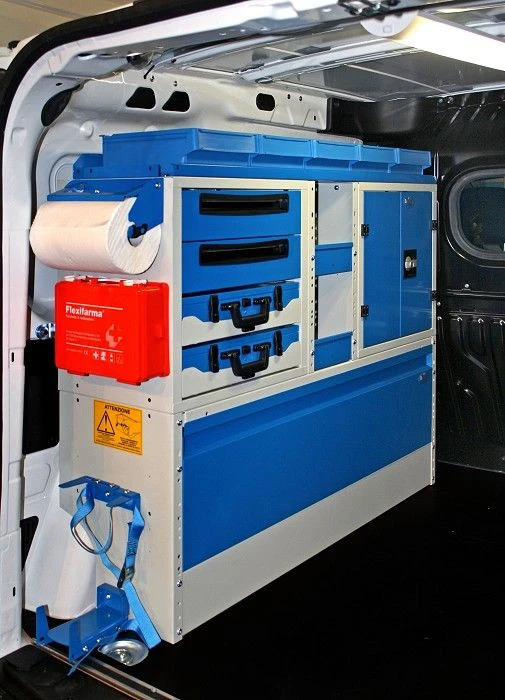 Above the wheel arch frame, we mounted a drawer unit with steel drawers (each one sliding on ball bearing glides) and two pull-out storage trays that each contain a portable utility case, complete with internal plastic containers for small parts and fittings. On the right side, we also mounted an aluminum and steel van locker. Between the shelving unit and locker unit, we installed two shelves, and above them, five polypropylene containers with dividers – perfect for storing small parts, fasteners, and fittings. On the right side, we first placed a closed wheel arch base with a hinged front door, two large portable polypropylene containers with steel handles, and a shelving unit with two shelves, complete with aluminum dividers that can be inserted according to the client’s needs. 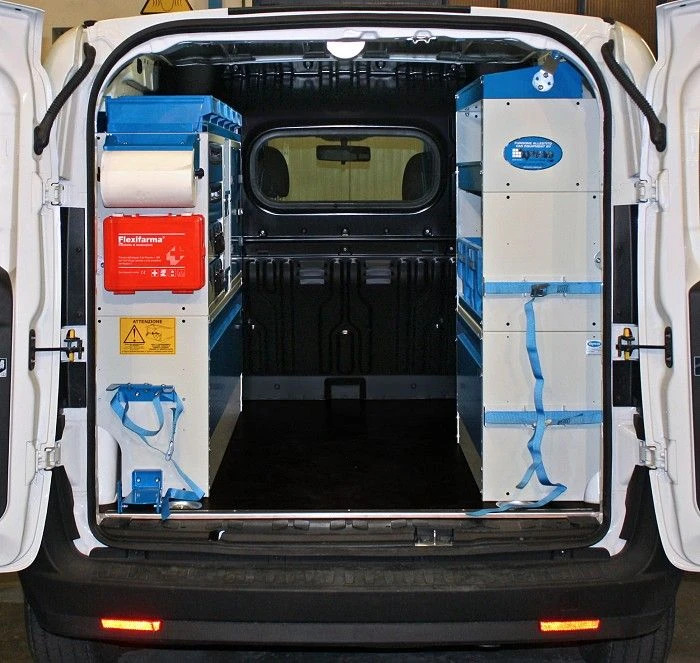 This Doblò upfit is enhanced with several practical van accessories: mounted on the back door is the Syncro hand washing kit (water jug with spout and soap dispenser), while on the end panel on the left side, we placed a wall-mount for a fire extinguisher, a first aid kit, and a paper towel roll holder. On the right side end panel, we mounted two sturdy straps for securing longer bulky objects. Click here and here to discover other Doblò upfits, internal cargo panels and linings for the Doblò, luggage and utility racks for the Doblò. Here an example of Dobò with cargo bars; here van racking fot Doblò long wheelbase.